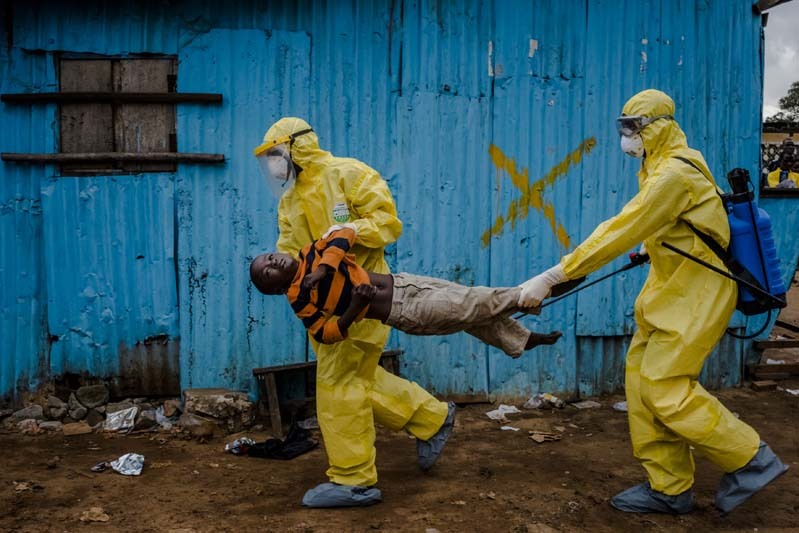 MONROVIA, LIBERIA - SEPTEMBER 05, 2014: James Dorbor, 8, suspected to have Ebola, is rushed in by medical staff wearing protective clothing into the JFK Ebola treatment centre on September 05, 2014 in Monrovia, Liberia. James Dorbor, 8, had been sick and showing symptoms of Ebola for previous 3-4 days - extreme weakness, loss of appetite, toileting and vomiting.. Edward, James father first took the boy to the S.O.S clinic, nearby for treatment, but being an ordinary hospital medical staff were too afraid to treat the boy. Edward then walked James to the JFK Ebola treatment facility nearby. That day the scene outside of the JFK was chaotic. One boy lay dead in the back of an ambulance, as three of his family members sat inside with the body. Two family members lay in the back of a taxi unable to move. Others lay strewn on the dirt, underneath a shelter, too weak to stand, some laying on benches. James lay on the dirt outside of the JFK centre for hours waiting to be admitted. Edward fought hard to get his son to drink fluids but to no avail. At one point James convulsed for a few minutes and then lay motionless. Onlookers gasped and Edward reacted believing that his son had passed, but the boy still hung on for a few more hours. Late in the afternoon, the gates opened and the waiting people rushed in to the clinic leaving James on the ground as he was unable to move on his own. His father was too afraid to carry him as he only had a pair of gloves on and onlookers were already worried that he had had too much contact with his son. Edward ran to he heavy gate and beat on the door to get attention and informed them frantically of James condition. It took health workers some time to dress themselves in protective clothing and then rushed the boy inside once the area had been sprayed with chlorine surrounding the boy. According to health officials, James passed away shortly after being admitted.